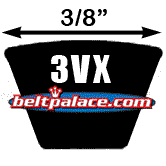 3VX Series Molded Notch V-Belts: 3/8" (0.38") Wide and 5/16" (0.32") Thick. We are currently updating our online inventory. If the belt number you need begins with "3VX---" you may call and order directly through customer service at (317) 519-9020. No minimums or additional fees to order via phone. We appreciate your business! 3VX250 Molded Notch (Cogged) V-Belt. 25" Length (OC). 3/8" (0.38") Top Width.